New exhibit: "Law Books Bright and Beautiful"
Although law books may not be known for their beauty, two dozen lovely exceptions are on display in the Lillian Goldman Law Library. 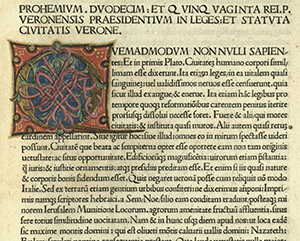 “Law Books Bright and Beautiful: Examples from the Yale Law Library Collection” is on display February 26 - June 1, 2018, in the Rare Book Exhibition Gallery, located on Level L2 of the Yale Law School (127 Wall Street, New Haven CT). The exhibition was curated by Rare Book Librarian Mike Widener. He selected the books for the beauty of their typography, decoration, or overall design. The volumes range from a 13th-century illuminated manuscript to modern fine press books on famous American trials. Other volumes include the mining laws of New Spain (1783), the statutes of Verona (1475), and a stunning book of French customary law (1540) printed on parchment with initials in gold leaf. Three of the books were chosen for their colorful endpapers. Images from the exhibition are being uploaded to an album on the Rare Book Collection’s Flickr site, “Law Books Bright and Beautiful.” Images from other beautiful law books will be added as time allows. “Law Books Bright and Beautiful” is the latest in a series of exhibitions aimed at promoting the study of law books as objects. It follows two exhibitions dedicated to illustrations in law books. Bindings will be showcased in an upcoming exhibition. For more information, contact Mike Widener, Rare Book Librarian, email <mike.widener@yale.edu> or phone (203) 432-4494. Senlis (France). Les coustumes des duchez contez & chastellenies du bailliage de Senlis. Paris: Galliot du Pre & Jean Andre, 1540. In honor of Black History Month, the Lillian Goldman Law Library is pleased to make publicly available one of the most comprehensive contemporary accounts of the case of the Amistad captives. 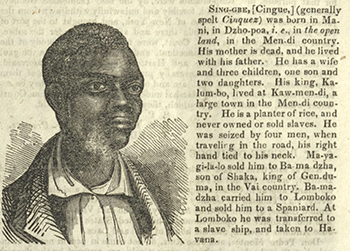 Documents Relating to the Africans Taken in the Amistad was originally published as a 16-page special issue of the American and Foreign Anti-Slavery Reporter, a monthly newspaper published in New York City by the American and Foreign Anti-Slavery Society. Dated December 1840, the “Extra” begins with a lengthy account of the Amistad incident by Judge William Jay, one of the society’s founders. It reprints court documents, official correspondence, and records from the Spanish and British governments. In addition there are biographical sketches of the captives, and a facsimile reproduction of a letter from one of the youngest captives, Ka-Le, to Lewis Tappan, the society’s founder. Documents Relating to the Africans Taken in the Amistad is one of several historic publications in the American Trials section of the Yale Law Library Special Collections documents collection, part of eYLS, the Yale Law School Legal Scholarship Repository. ConnecticutHistory.org has put together a thorough guide to online resources on the Amistad case. To find all of the Law Library’s holdings on the Amistad case, do a subject search for “Amistad (Schooner)” in our online catalog, MORRIS.